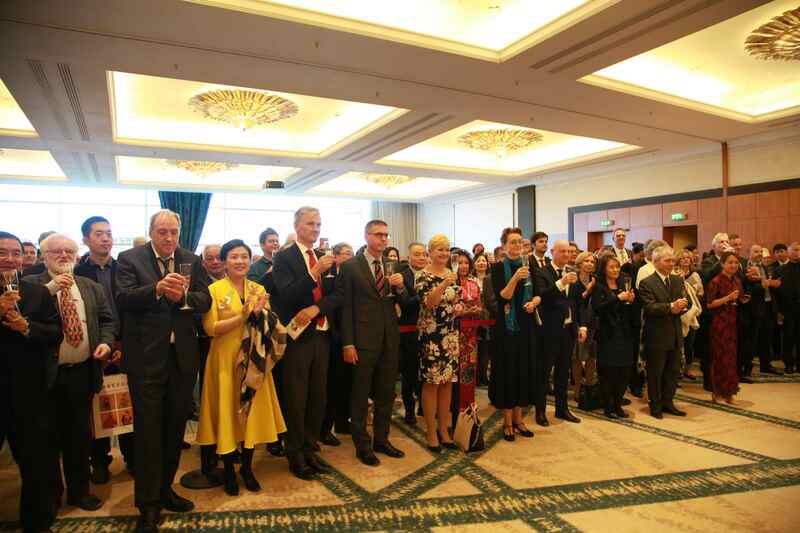 On September 25th, the Chinese Embassy in Denmark held the reception at Marriot Hotel Copenhagen to celebrate the 69th anniversary of the founding of the People’s Republic of China. Over 400 guests attended, including Danish Minister for Fisheries and Equal Opportunities and Nordic Cooperation Eva Kjer Hansen, State Secretary for Foreign Policy Jonas Bering Liisberg，State Secretary for Trade Susanne Hyldelund, The President of Danish Supreme Court Thomas Rørdam, Rear Admiral and Dean of Royal Danish Defense Academy Henrik Ryberg, Vice president of Lego Peter Trillingsgaard, Secretary General of the Nordic Council of Ministers Dagfinn Høybråten, more than 40 ambassadors and representatives from the Diplomatic Corp, representatives of local Chinese institutions, overseas Chinese and scholars and students in Denmark. Chinese and Danish National anthems are played at the beginning of the reception. In her address, Ambassador Deng illustrated with vivid figures what China achieved since its founding and reform and opening-up, highlighting the Boao Forum for Asia this April, the Shanghai Cooperation Organization summit in Qingdao this June, the Forum on China-Africa Cooperation Beijing Summit early September and the first China International Import Expo(CIIE) to be held in November. She underscored the very sound development of the China-Denmark Comprehensive Strategic Partnership during the past decade as well as the very bright future and ever-riching content of bilateral bonds, foreseeing an ever broadening horizon in terms of China-Nordic Cooperation, China-EU relations, as well as dialogue and cooperation in ongoing international affairs. 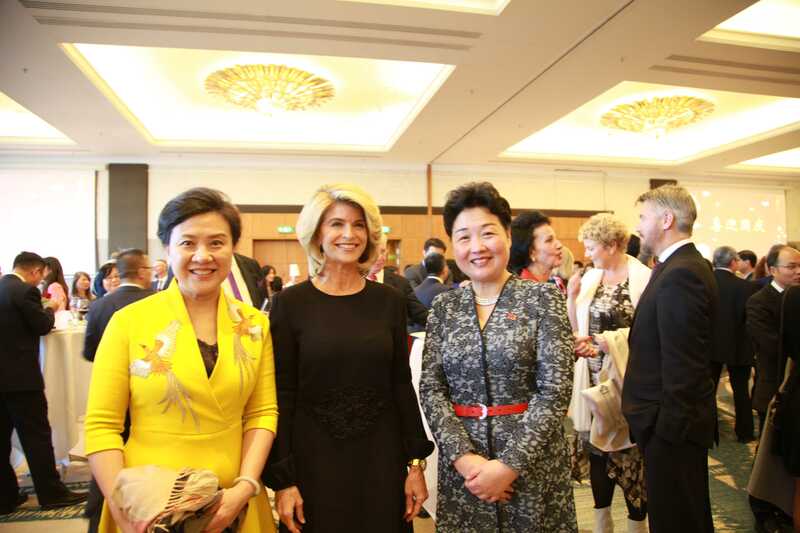 The guests, impressed by the vivid China stories and concrete figures, think highly of her speech. 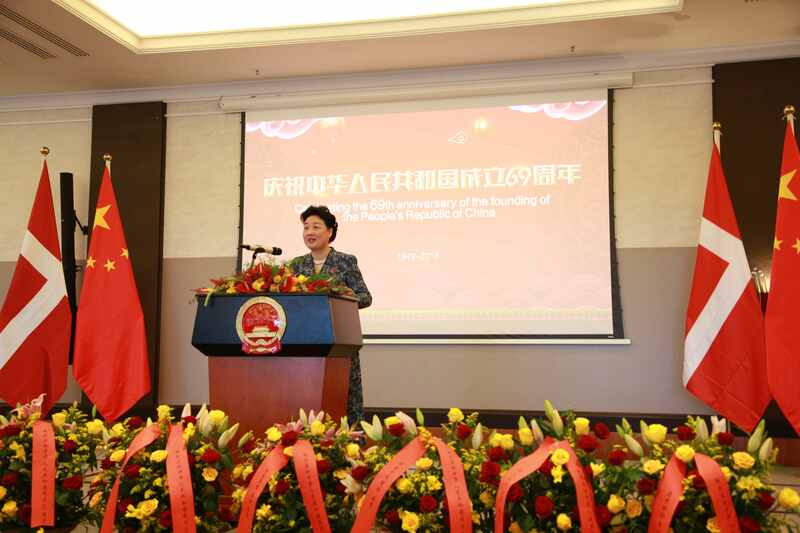 Minister Eva Kjer Hansen sent her congratulation on the 69th anniversary of the Founding of the People’s Republic of China. 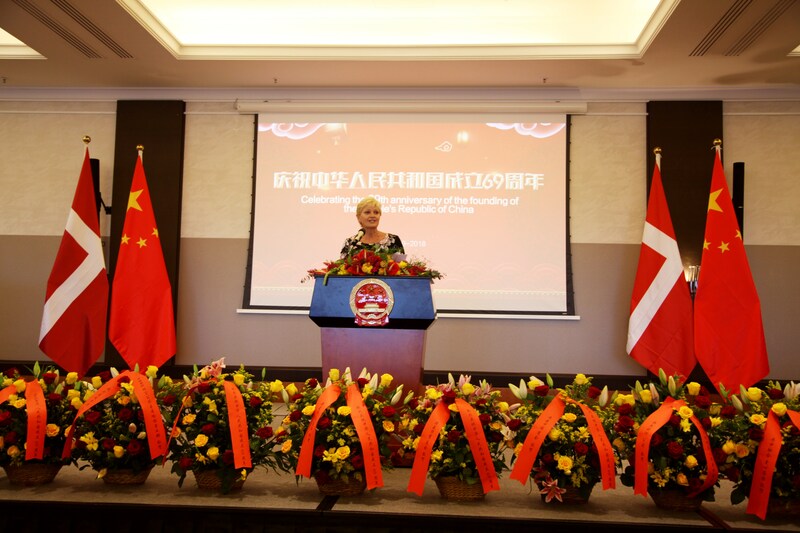 Citing the successful career of Mr. Sai-Chiu Van, one of the early Chinese settlers in Denmark, she underlined the deep-bond between Denmark and China is history-rooted, and maturing through active interaction between their peoples and cultures, facilitating respective advances. 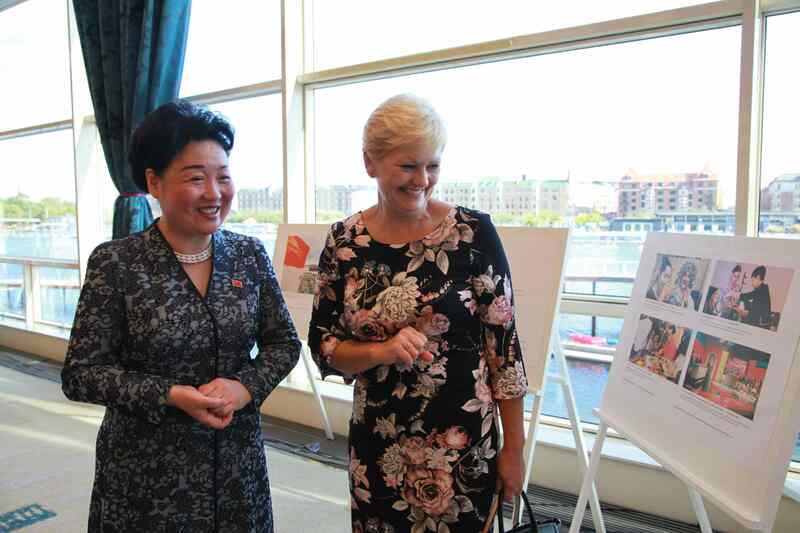 She expressed her satisfaction that China is the 6th largest trading partner with Denmark, and took pride in personally pushed for the joint research cooperation on giant pandas, hoping that they could arrive soon and an even more fruitful bilateral bond. 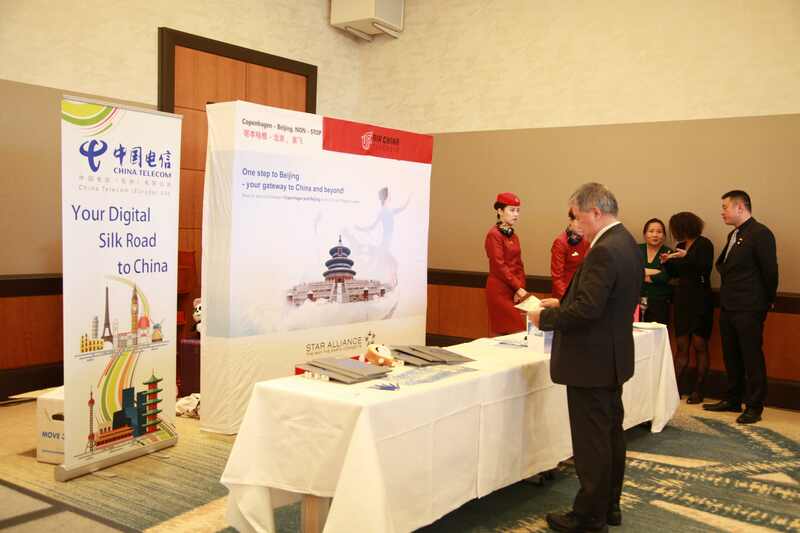 The guests also enjoyed the Belt and Road deliverables photo show, product demonstrations held by Chinese enterprises in Denmark, as well as documentaries covering China 2018, China-Africa cooperation and CIIE. 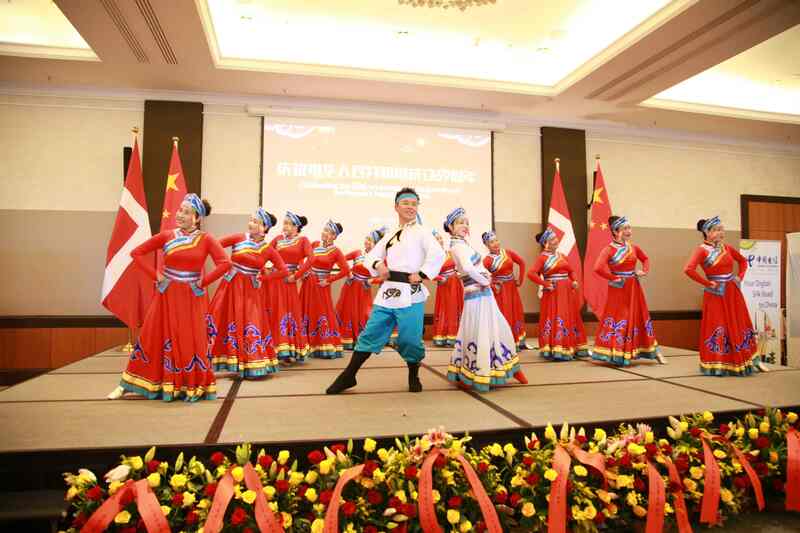 They also had a good time with Peking Opera performances staged by National Peking Opera Company, as well as violin Solo and dance by local Chinese. The guests are deeply impressed by the innovating formats and contents of the reception. 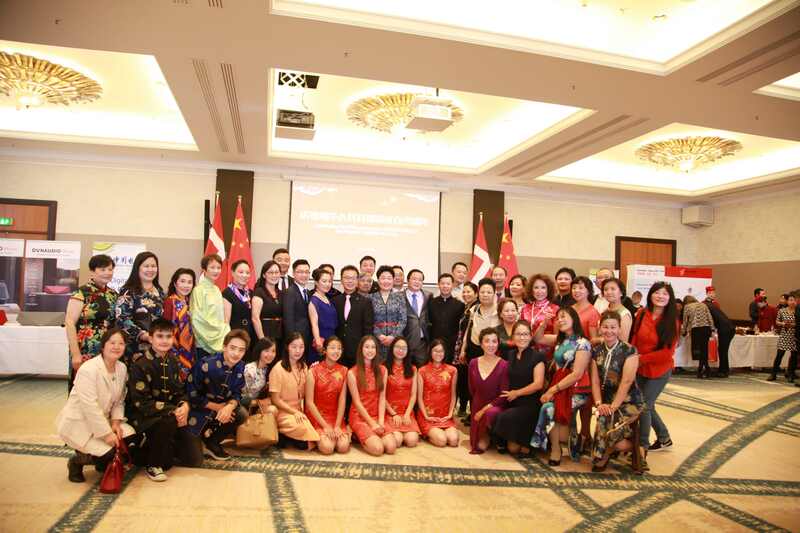 They express their congratulations on the 69th anniversary of the founding of the People’s Republic of China, appreciating China’s achievement over the years, sending their best wishes for a prosperous China and everlasting friendship between Chinese and Danish peoples.